Group winner Grunt will stand at Yulong in 2019 (Racing Photos). Multiple Group 1 winning Grunt (NZ) will spearhead Yulong Investments move into the stallion market in 2019, standing at the operation’s Yulong Farm in Nagambie, Victoria for a fee of $13,750 inc. GST. “It is tremendously exciting for Yulong’s stallion division to be launched with a dual-Group 1 miler the quality of Grunt. 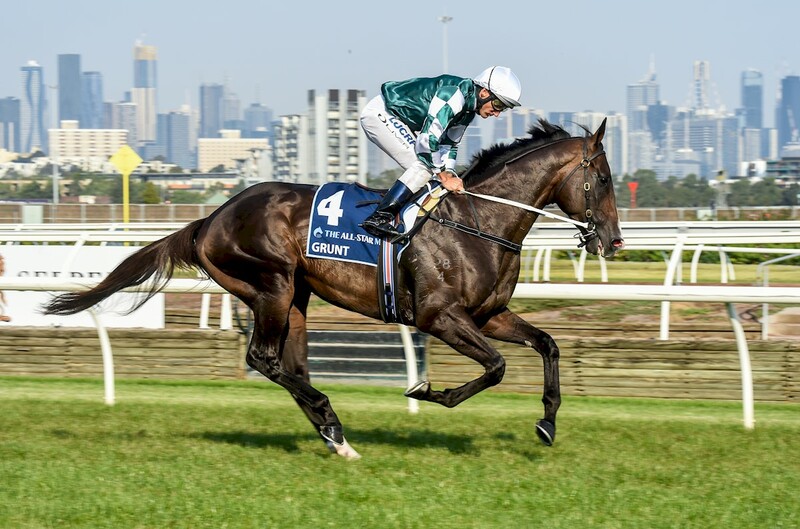 Many of the best stallions throughout history have excelled at a mile and we believe Grunt has the profile for success at stud,” said Sam Fairgray, Chief Operating Officer of Yulong Investments. Purchased from the 2016 New Zealand Bloodstock National Yearling Sale for NZ$220,000 by Cameron Cooke Bloodstock and trainer Mick Price, the son of O’Reilly made a quick impression on the track. Having only the one 2 year old outing, placing third to eventual Group 1 winner Aloisia, Grunt broke his maiden impressively at the beginning of his second campaign when starting a four-race winning streak. Showing his talent, his third victory was in the Group 3 C S Hayes Stakes, defeating Cliff’s Edge and Embellish. This campaign culminated with a tenacious victory in the Group 1 Australian Guineas, in only his fifth career start. Winners of this race to have gone on to be successful stallions include Zabeel, Flying Spur, Pins, Dash For Cash and Reset. Grunt returned as a 4-year-old to impressively win the Group 1 Makybe Diva earlier this season by two lengths at Flemington, beating eight Group 1 winners in the process. He retires with a Timeform rating of 123 as a four year old, ranking him as elite among his generation. “An outstanding individual and brilliant 1600m horse. Grunt had an excellent temperament and I think he will make an excellent stallion,” said Mick Price. From a stallion-making family, Grunt’s dam is a half-sister to New Zealand Horse of The Year and promising New Zealand sire Ocean Park. Grunt’s dam Ruqqaya is a two-time winning mare who has also produced stakes performer Addison from three to race. Like promising young stallion Dundeel, Grunt carries Zabeel on his dam side and is free of Danzig blood. Grunt is one of 13 Group 1 winners by dominant New Zealand sire O’Reilly, whose sons Alamosa and Shamexpress have sired six Group winners including three Group 1 winners. “On type and pedigree Grunt will suit a wide variety of mares, which is one of the major attributes that attracted us to him,” Fairgray said. *Release courtesy of Yulong Investments.